"Good evening. Hello. I have cancer. How are you?" 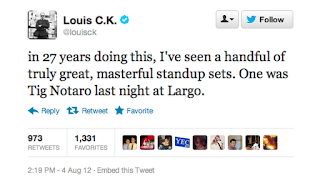 Tig Notaro was diagnosed just three days before a standup comedy set with invasive cancer in both of her breasts. What happened afterwards is quickly becoming the stuff of Internet legend. She decided to get up on stage and deliver a half and hour act that quickly make the social media rounds. 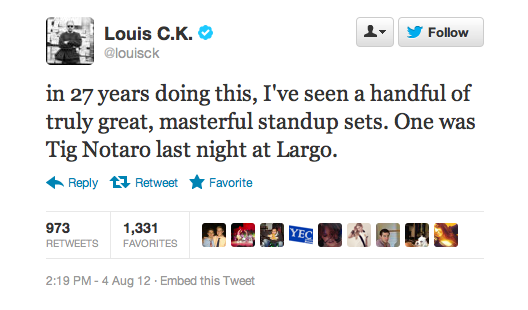 It started off with comedian Lewis C.K.’s tweet: “in 27 years doing this, I've seen a handful of truly great, masterful standup sets. One was Tig Notaro last night at Largo.” The larger media outlets came quickly after, including interviews on NPR and This American Life. Notaro was brutally honest and open about a subject that is often taboo to talk about in many settings. During the set she talks about a stream of personal tragedies that led up to the diagnosis of cancer including a pneumonia, a C. difficile infection, a traumatic death of her mother from a fall, and a breakup from a longstanding relationship. She does this in such a way that is so raw that it is nearly impossible not to be moved. It's OK. It's going to be OK. It might not be OK. But I'm just saying, it's OK. You're going to be OK. I don't know what's going on with me. I think that humour is the best pain killer. I really look up to those people, who can make jokes even in the hardest situations!